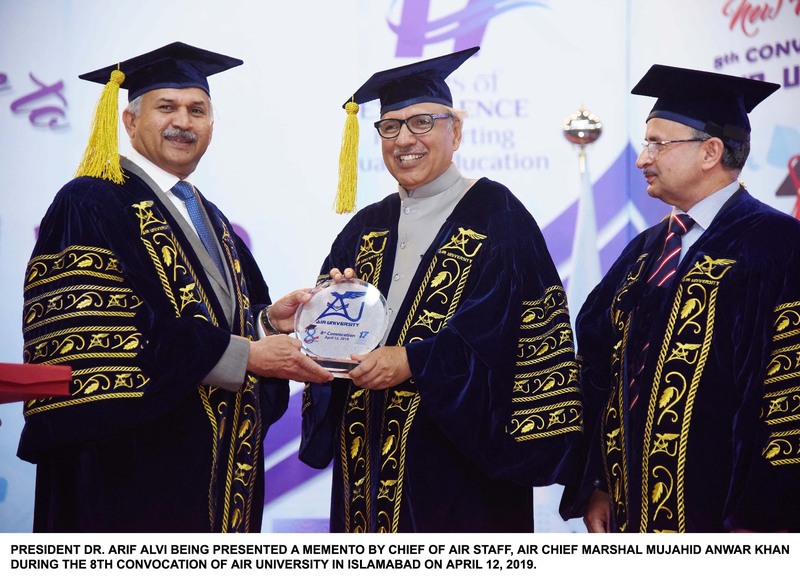 PRESIDENT DR. ARIF ALVI BEING PRESENTED A MEMENTO BY CHIEF OF AIR STAFF, AIR CHIEF MARSHAL MUJAHID ANWAR KHAN DURING THE 8TH CONVOCATION OF AIR UNIVERSITY IN ISLAMABAD ON APRIL 12, 2019. President Dr Arif Alvi on Friday said that the opening of E-visas and visa on arrival facilities would attract more businessmen and tourists towards Pakistan. The government is committed to providing amiable business environment to the foreign investors in the country, he said while addressing the inaugural dinner of the 2nd International Textile Expo 2019 here. The president welcomed the 300 foreign representatives besides 400 exhibitors to the four-day TEXPO. He added the China -Pakistan Economic Corridor (CPEC) provides multifarious business opportunities and development of Gwadar Port would go a long way in improving the communication and transportation for the textile and other industries. President Alvi contented that seven new economic zones are being established in the country which offers great investment opportunities to the foreign businessmen. Last month, Prime Minister Imran Khan had inaugurated Pakistan’s online visa regime for foreign nationals, in a ceremony held in Islamabad. Addressing the ceremony, PM Khan had said, we need to change that mindset so that investors could come to Pakistan and make an investment here. The issuance of online visas for foreigners was the first step towards ‘Naya Pakistan’, he had said.